A few weeks ago, Warcry magazine approached Colleen about the issue of parenting children who are acting out. Here is what she shared with them. It takes some hefty detective work to understand why your child is ‘acting out’, writes Colleen Morris. A parent needs to be patient, curious, observant and attentive to what their child’s behaviour is trying to call attention to. Here are seven common reasons your kids may be struggling. Negative behaviours such as bickering, criticism, sarcasm, yelling and fighting create an environment that is stressful and unpredictable. Often a child acts out to draw parents’ attention away from each other and therefore lessen the tension in the relationship. The years following a parental separation can cause emotional distress for children. Sadness, guilt and anger can all drive a child to ‘act out’ because they feel their whole world has been dismantled. A child’s grief is as keen as your own and has no set time limit or method. The loss of a parent, grandparent, close friend or a pet are life experiences that are frequently confusing, sad and, when not given expression, can be toxic to our body and our emotions. Being ‘time poor’ is one of the hazards of our fast-paced lifestyle. Many parents are simply preoccupied with the challenges of daily life, so when we fail to notice that one of our children is lonely and needing our attention, they can look for ways to draw attention to themselves. How does a child talk to a parent about ‘the unmentionable’ without feeling shame, terror, embarrassment or fear of not being believed? There are times when the abuse is within the family context—sometimes it is a family friend or neighbour, sometimes it is someone bullying them at school, and at other times it is happening in cyberspace. Acting out may be a ‘cry for help’ in this instance. When children are young, parents create rules and boundaries—spoken and unspoken—that define acceptable behaviour. As our children grow and develop, we must continually redefine these. When a parent’s rules remain rigid and unrealistic with regard to their child’s changing world, a child typically feels resentful, annoyed and angry. When unaddressed and unresolved, you or your parents’ past trauma continues to be alive and present in the experience of your children. Where there has been war, abandonment, neglect and other extremely traumatic experiences, the pain and distress of the past will continue to find its echo in the present as long as it is unacknowledged and the impact unrecognised. Learning how to listen attentively, build trust and teach your child to name their emotions are vital for their behaviour to settle. If your child is acting out, sit down and listen to them. By addressing the real issues you can build trust with them during this difficult time. Is your child ‘acting out’? Are you concerned about your kids’ wellbeing? Call Colleen on 0434 337 245 or Duncan on 0434 331 243 for a FREE 10 minute consultation. To make an appointment, go to BOOK NOW and you will be able to access Watersedgecounselling’s online appointment diary. Thank you to Warcry magazine for publishing this piece in its week-to-week column. You can read it on its website here. 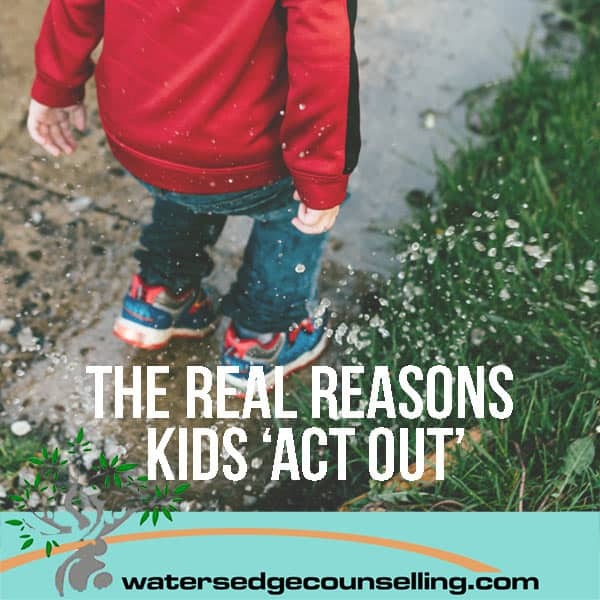 It was originally published on Watersedge in September 2016 as ‘7 Reasons Your Child Might Be Acting Out’.